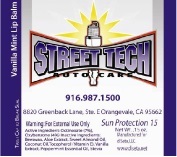 Street Tech is proud to support these local businesses located in our surrounding community. B&J Towing – B&J Towing has been in business since 1961. They are a AAA affiliate, offer 24 towing/roadside service with mobile battery testing and replacement and digitally dispatched drivers for prompt service. Di Seta, The Perfect Lip Balm Di Seta is an Orangevale, locally based company specializing in all natural products such as lip balms and soaps. Their unique packaging allows your company to advertize on a hand-crafted beauty product. Gold Canyon Candles Gold Canyon is a party-plan candle business with more than 26,000 Independent Fragrance Consultants across North America. Our local consultant, Nancy Shores, can provide for all of your home fragrance needs. The Finishing Touch The Finishing Touch offers a myriad of personalized interior decorating services and resources. Each service is tailored to suit your individual home décor needs.